To read the Welsh poem and find its adjacent English version is like diving into one pool to discover it linked underwater to a twin, from which one emerges, amazed to have experienced two related worlds whose contents are refracted to the eye and ear by differing slants of colour, angle and echo: an exciting, astonishing experience – and repeatable! 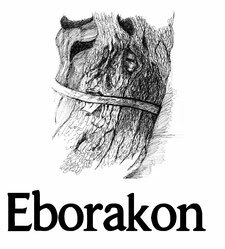 Do read these poems now in the Special Online Issue: Europe of Eborakon poetry magazine. The impossible is achieved: one lives the same moment twice. The step further, into the almost miraculous, is that, even better, one lives it afresh. The calibre of the English translation makes this possible. Each poem succeeds. Of the many things that could be said about these poems I want to proffer only a few remarks. This is not the poetry of pyrotechnics. There’s nothing showy here. There is, rather, a tremendously assured hand at work. What strikes me first and foremost is a mastery of structure, so sure it is a delight in itself. For example: the poems’ titles earn their keep: they appear, vanish but return with a precise and devastating impact. Henaint / Old Age is the concept offered at the outset but one is immediately tugged firmly away and plunged into the plight of Judge Sisamnes and ‘the details’ of a painting of his being flayed alive as punishment for mercenary corruption, Am werthu cyfiawnder / For selling justice. I was baring my own teeth in an involuntary imitative reaction to this horribly intimate stripping. The Welsh rendition is particularly effective here because the mouth’s shaping of dynn.. dyn…ddiosg itself requires something of a teeth-on-edge grimace. As if a man’s skin should be shed…. Merthyrdod henaint. / Old age is a martyrdom. The Welsh has a relishable economy here: merely two nouns set starkly together. However, that word martyrdom (though accepted because empathy with Sisamnes has been earned) gives an important twist to the reader’s mental wrist, wringing out the reaction the poet is working towards. Sisamnes was not a saint but a criminal yet martyrdom keeps one’s sympathies firmly where the poet wants them, in a visceral identification with the suffering person, whether guilty or not. Rhy denau – fel traed morforwyn! Is too thin – like mermaids’ feet! Am gyfiawnder, llosgai yng nghadair ei gyfrifoldeb. He burned on the throne of his shame. This son-judge is unlikely to repeat his father’s crime. The reader, who takes his own father’s place in the scheme of time, is similarly prompted to consider how his forebear’s fate is influencing his own behavior and also how none of us can escape time’s flaying, exposing cruelty. This concluding section contains two striking examples of difference in the English and Welsh vocabulary: in English we have Sisamnes’s son; in Welsh his etifedd, his heir; in English the final word is shame; in Welsh responsibility, with tones of accountability. The Welsh, to my ear, is therefore a shade more institutional. These poems appear in Eborakon’s online feature on European poetry thanks to Prof. M. Wynn Thomas of Swansea University. I take it Gwyneth Lewis endorsed his linking the poems to ‘the recent referendum’ but I suspect, as he seems to also, that such a linkage was ‘temporarily large’. “Let it be plainly stated: Gwyneth Lewis’s poem – even more taut and pungent to my taste in Welsh than it is in English – has very little to do with this issue. It is clearly (and very poignantly) about loss, ageing, mortality, and indeed the whole process of ‘inheritance’ (an issue of inescapable potency for any Welsh speaker of today). I have deliberately not included an example of the Gerard David painting that inspired these poems. They are so visually acute that an illustration is not essential. A quick Google will pull it up. These two poems provide two opportunities: to witness a collision between corruption, the operation of justice, an absence of mercy and the effect on the innocent but implicated; and to wander in ‘the baffling forest’ of deserved and unmerited suffering.